A warranty deed is used when a seller of property needs to demonstrate they hold a title for the real estate and that they can legally sell it to another buyer. A warranty deed is used when a seller of a property needs to demonstrate they hold the title to the real estate and that they can legally sell it to a buyer. The deed will look at the history of the property in addition to the current grantor's ownership. The warranty deed will cover many different covenants. This property law deed will require a lot of information in order to be legally binding. Since this is the deed being used to transfer property from one person to another, it is important to have as much accurate information as you have access to. It can be beneficial to seek legal advice and have your counsel review your completed warranty deed to ensure you have included all necessary information in the document to allow you to transfer properties. Long gone are the good old days when property could be legally transferred with a handshake and honest intentions. To ensure that a property transfer will be relatively trouble-free, a document known as a warranty deed will be needed. Therefore, it will be worthwhile to learn the basics of this essential instrument. Broadly speaking, the purpose of a warranty deed is to guarantee that the seller of some property—often including land—holds free and clear title to (i.e., ownership of) that property as well as the right to sell it to the purchaser. While a warranty deed is not the only legally recognized method of ownership transfer, it is often preferred because it specifically attests that the seller not only has the right to sell the property but also that the property is entirely free of debt or liens. This, by itself, could undoubtedly mean fewer hassles and headaches for the prospective purchaser. This provides a much broader protection than title insurance, which only protects against claims on the property. In addition, a warranty deed guarantees that the property has not already been sold to someone else; furthermore, it ensures that the seller will be responsible for any faults or problems related to the property. While these considerations will indubitably benefit the purchaser, they also provide a measure of credibility to the seller. Thus, whether you're a buyer or a seller, and regardless of whether you're dealing with a business or an individual, if you want to avoid ownership-related problems down the road, a warranty deed might be your best option. When finalizing the terms and language of a warranty deed, there are certain things you'll want to look for. Naturally, the names of the buyer and seller should be there, as well as their physical addresses; post office boxes should generally be avoided. There should be a description of the property that is being transferred, along with a specification of the county and state where the seller is to sign the warranty deed. Moreover, there should be an indication of whether or not money is to be exchanged for the property, and if so, then the exact amount should be specified. Next, you'll want to know the two main types of warranty deeds and how they are different. One type is known as a general warranty deed. This is the most common type of warranty deed, and it covers the entire history of the property. In this type of warranty deed, the seller is responsible for any claims against the title or any debts, damages, or other issues with the title dating back through the property's entire history, even before the seller owned it. From the standpoint of the buyer, this is the best type of warranty deed to have in most cases. For this reason, general warranty deeds are considered the standard means of transferring property, especially among buyers who seek assurance that the property is entirely free of liens, title challenges, pending legal actions, and other encumbrances. There is a second type of warranty deed that you should know about, and this is known as a special warranty deed. This also assures the buyer of freedom from title-related issues on the property being transferred, but only for the period in which the seller owned that property. In other words, the seller will only be legally responsible for debts, liens, and other title-related issues caused or incurred during his or her ownership of the property. As a result, there will be no assurance given that the previous owners (assuming that there were previous owners) did, in fact, own the property without title challenges or other problems. If such problems existed, there would be the distinct possibility that the buyer would inherit those problems; consequently, a special warranty deed might not be the ideal option in many cases. As always, caveat emptor – let the buyer beware! Now that you know the purpose and types of warranty deeds, you may be wondering where you can find a legally valid warranty deed form. One thing to keep in mind is that the wording of the form will vary by state or county; there's no such thing as a universal form that covers all regions. Therefore, if you're planning to hire an attorney to draft the form, make sure that he or she is qualified and knowledgeable in regard to the particular laws of the region under consideration. As you might expect, it can be reassuring to have an attorney provide you with one of these forms, but it can also be expensive. If you have the do-it-yourself spirit, be sure to get one that meets the specifications of the state or county in which you plan to file it. After checking the form to make sure that it's completely accurate, be prepared to have the form notarized when all parties sign it. Also, expect to pay a nominal fee when you file the deed at your local courthouse. Compared to most legal paperwork, warranty deeds are relatively simple and stress-free. Just as with any legal matter, it never hurts to know the facts. When it comes to warranty deeds, learning about them can make your property transferal much smoother, easier, and devoid of unexpected problems. 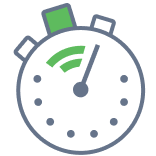 Create a free Warranty Deed in minutes with our professional document builder. When Should You Use a Warranty Deed? You should use a warranty deed any time you purchase a property from a buyer. Doing so ensures that you will receive protection against any unwanted surprises after taking ownership of your new property. Some feel as though warranty deeds are not needed if they purchase property from family or friends, however, neglecting to use one and outstanding claims or liens arise against the property, it can cause rifts in your relationships. Grant deeds are very similar to general warranty deeds and depending on the county or region, the two are fraternal twins. An owner can use a grant deed instead of a warranty deed and have the same protection. However, this is not the case in all regions of the united states. In some parts of the country, grant deeds offer all the same protections as a warranty deed, protecting against claims to the land, liens, and restrictions. However, in the majority of the country, grant deeds do not protect against third-party claims to the land. Bargain sale deeds to not protect against encumbrances on the property. These basic warranty deeds only warrant that the seller possesses the title to the property, and does not protect against claims, liens or encumbrances. These types of titles are generally used when a buyer is purchasing a foreclosed home. In order to transfer ownership of real property between parties, a legal document known as a deed is required. Warranty deeds are the most commonly used version of this document. The warranty deed form contains certain guarantees by the grantor to the grantee that his or her title is good. These guarantees are sometimes referred to as covenants for title. Depending on the fulfillment of these covenants, warranty deeds are classified as either general or special. The general warranty deed form is used if the grantor can guarantee all of the usual covenants on a piece of real property. A special warranty deed form is used if the grantor can promise only limited warranty. 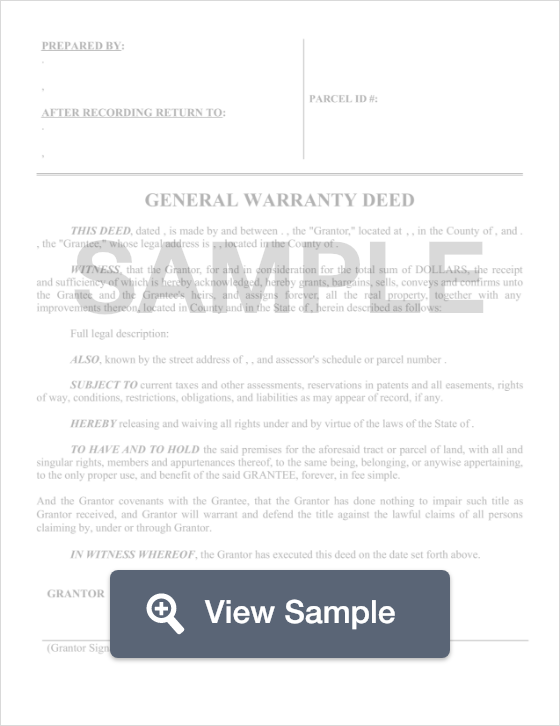 A free warranty deed template will include the following basic components: the names of the parties to the claim (the grantor and the grantee), a statement of consideration, a granting clause that includes definite operative words, words of inheritance, a description of the land or property being conveyed, a habendum, and, most importantly, a statement of the grantor’s warranties or covenants. The first two covenants are nearly the same. The covenant of seisin and the covenant of right to convey both promise that the grantor has an estate of the quantity and quality which he claims. The covenant against encumbrances guarantees that there are no outstanding mortgages, leases, taxes, liens, easements, restrictions on the use of land, etc. on the property in question other than those specifically mentioned. The covenant for quiet enjoyment and the covenant of warranty are also usually considered together. They assure that the grantee will enjoy the property, without risk of eviction by a third party with a lawful claim of better title. If one of these guarantees proves false, then it is referred to as a breach of covenant. For example, if a third party does claim superior title to the property in question, this is a breach of the covenant of warranty. The covenant of warranty will not be breached if the claim is unfounded, nor will it be breached if the grantee pays a third party claimant voluntarily without suit. The grantee must either be evicted or forced to surrender possession of the property in question via a court decision. In such an event, the covenant of warranty promises that the grantor will compensate the grantee for their losses. In a special or limited warranty deed template, the grantee is only provided some of these covenants. The grantee is only protected against persons “claiming by, through, or under” the grantor. This means that the grantor does not guarantee the title against defects prior to when he acquired the property, but only against those which arose during. The special warranty deed form is simply a transference of interest, along with an assurance that the grantor has done nothing to compromise the title in the period during which he held that interest. Warranty deeds require several pieces of information from both the buying and the selling parties. This information is not extremely personal, and most likely, both parties will know off the top of their heads or be able to quickly reference in pertinent documents. Property address -- this includes the physical address, the property's parcel number, and its legal description. The legal description of the property is not your observation of what the property looks like. Instead, the legal description can be found on the Seller’s Deed or the location where the property’s taxes are paid. Names and addresses of the parties involved in the warranty deed -- this includes the full physical addresses of both parties. Avoid listing P.O boxes. The county where the seller will sign the warranty deed. If money is being exchanged for the purchase of this property -- If the title is being changed or inherited, there is often no money exchanged. However, if the property is being transferred via a traditional purchase, specify the amount. When you are buying or selling property, a warranty deed is an indispensable part of that process. The warranty deed form serves as a legal guarantee that the individual selling the property is the sole and rightful owner in the eyes of the law; that they, most importantly, have the legal right to make decisions regarding the property without regard to any other entity. Unlike a quit claim deed, which makes no guarantees regarding true legal ownership of the property, a completed warranty deed template offers a guarantee that the property’s ownership is clear. Prior to completing a warranty deed, the seller will need to obtain a copy of the property’s current deed, if it is not already in their possession. Once the current deed is in hand, a warranty deed form must be completed either through an attorney or (far less expensively) by finding a free warranty deed template online. The pertinent information must be filled out clearly, including the date and full names of the current owner (“grantor”) and owner-to-be (“grantee”). Then, you’ll need to list out the “consideration” for which the property is being transferred; in other words, what amount is being paid for the property. Next, the free warranty deed form will require specific information on the property in question. This description protects both the seller and buyer, ensuring that the specifics of the property to be transferred are clear and understood by both parties. A legal description of the property must be listed in the warranty deed template, including the properties dimensions, measurements, and boundaries. To make matters easier, you can simply copy over the legal description that is on the current deed if nothing has changed. If the property has changed, you’ll need to have a licensed surveyor conduct a survey to get a new legal description. You can then enter it on the warranty deed template. Once the warranty deed form is completed, it will need to be signed by the current owner. If there is more than one owner listed on the deed, then all owners must sign the warranty deed. Be sure to sign in front of a qualified notary only, as warranty deeds must be notarized to be valid. Once this step is complete, you can file the signed and notarized warranty deed at your county’s local recorder’s office. When the warranty deed has been signed, notarized and filed with the county, the property transfer is complete. Before a seller can obtain a warranty deed, he or she must first ensure that the property being sold is free from liens, claims, or encumbrances. This can be done by doing a title search and a review of various public records pertaining to the home. Once you are sure that your property is free of any issues, it is then safe to obtain a warranty deed. As a seller, you want to be sure that there are no issues related to your home because you can be held liable if you sign a warranty deed and issues later arise. You can obtain warranty deeds from a local realtor’s office, or off the internet by downloading a quality template. Once the form is completed, it will need to be notarized by a notary public to legalize the document. In order for a warranty deed to be legal, it must be signed in the presence of a notary public. Next, the notarized document must be filed with the city or county office responsible for recording property documents. It’s important to note that in order to take this step, all previously billed property taxes must be paid in full. Our team at FormSwift created a datagraphic to show what the most common deed or deeds used for conveyance during the closing of a property sale are in each state of the US. Note that there might be certain instances in your state in which an additional deed other than the one (or multiple) listed is used. A Warranty Deed is where the seller (grantor) guarantees that they hold clear title to specific real estate and has a right to sell it to the buyer (grantee). A Residential Lease is a legally binding agreement negotiated between landlord and tenant. The Lease includes address of the property, duration of the Agreement, tenant and landlord contact details, an inventory of fixtures and fittings and pre-negotiated terms of the lease. A Commercial Lease is a legally binding agreement between a commercial landlord, and a business. It includes address of the property, business tenant and landlord contact details, inventory of fixtures and fittings, terms of the lease, and more. A person uses a Power of Attorney document to name a person that they want to take care of their personal or business affairs either because they are out of the country or because they are unable to take care of those issues on their own. These documents can be permanent or revocable in nature.